This Doodleman Pinscher nicknamed Red Collar Male sold and went to a new family. Puppy will have ears surgically cropped by a veterinarian using a laser October 5th and 6th. Puppy will all have a standard crop unless specified by the buyer. Puppy is micro-chipped, dew claws are removed, and tail docked after the second vertebrae. Both Parents of the sire Pharaoh are from Yugoslavia. 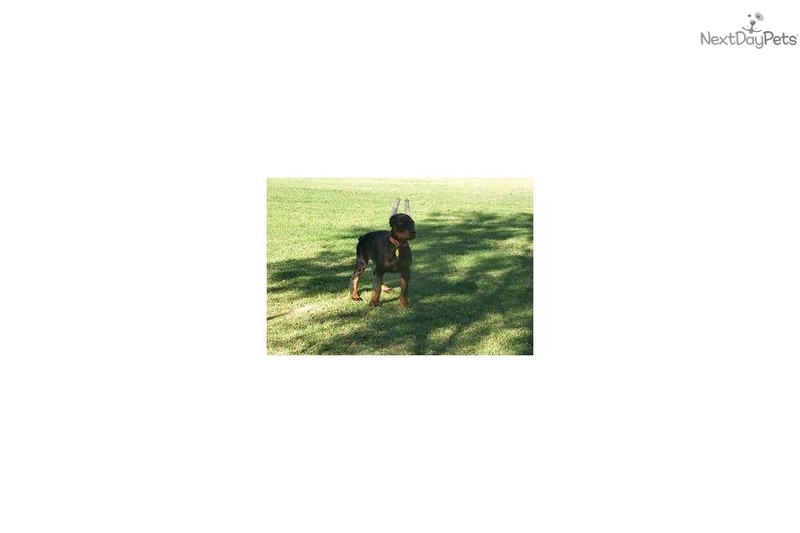 The mother of the dam Bindi is from Poland and the sire is from United States making the bloodline of this litter litter 3/4 European Doberman Pinscher and 1/4 American Doberman Pinscher. Buyer can expect dog to be between 29-31 inches at the shoulder and between 90-120 pounds. This litter will produce excellent working dogs, family protectors, and intelligent loyal companions. Plus actual airline shipping charge from Phoenix International airport to the puppy's destination and $35.00 for a plastic airline approved crate.